Although several arthroscopic procedures for lateral ligament instability of the ankle have been reported recently, it is difficult to augment the reconstruction by arthroscopically tightening the inferior extensor retinaculum. There is also concern that when using the inferior extensor retinaculum, this is not strictly an anatomical repair since its calcaneal attachment is different to that of the calcaneofibular ligament. If a ligament repair is completed firmly, it is unnecessary to add argumentation with inferior extensor retinaculum. The authors describe a simplified technique, repair of the lateral ligament alone using a lasso-loop stitch, which avoids additionally tighten the inferior extensor retinaculum. In this paper, it is described an arthroscopic anterior talofibular ligament repair using lasso-loop stitch alone for lateral instability of the ankle that is likely safe for patients and minimal invasive. Ankle Instability Group members are Thomas Bauer, James D. Calder, Numo Corte-Real, Ali Ghorbani, Mark A. Glazebrook, Stéphane Guillo, Jon karlsson, John G. Kennedy, Gino M. M. J. Kerkhoffs, Siu Wah Kong, Peter G. Mangone, Frederick Michels, Andy Molloy, Caio Nery, Christopher Pearce, Anthony Perera, Hélder Pereira, Bas Pinenburg, Fernando Raduan, James W. Stone, Masato Takao, Yves Tourné, Niek C. N. van Dijk, Jordi Vega, Jin Woo Lee. Lateral ligament reconstruction of the ankle is indicated when conservative measures have failed to improve functional lateral ankle instability in order to prevent subsequent disorders such as osteochondral lesions of the talar dome and osteoarthritis of the ankle [8, 9, 10, 17]. The direct anatomic repair of lateral ligaments of the ankle, originally described by Broström , is popular, and the subsequent augmentation of the technique by additionally tightening the inferior extensor retinaculum (IER) has resulted in good outcomes being reported in the literature . However, the open technique requires at least a 4-cm-long incision with significant dissection and soft tissue debridement, and it sometimes causes superficial nerve injury . 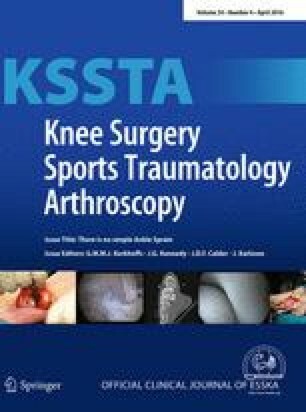 Recently, several authors have reported good results using an arthroscopy-assisted lateral ligament repair [1, 5, 6, 7, 12, 14, 15, 18]. Most of them also attempted to reinforce the construct by using the IER but found that this was both technically difficult and added significant surgery time to the procedure . There is also concern that when using the IER, this is not strictly an anatomical repair since its calcaneal attachment is 10 mm anterior to that of the calcaneofibular ligament (CFL) and this may thus restrict full plantar flexion of the ankle. The need to reinforce lateral ligament repair with the IER is therefore debatable . The lasso-loop stitch is one of the self-cinching stitches . Previous studies have shown that they have superior tissue-holding strength when compared to equivalent non-self-cinching stitches, and it is widely used with good clinical results in shoulder surgery to aid margin convergence in rotator cuff repairs and as traction sutures during stabilization procedure . The lasso-loop stitch is also simple and easy to use in a narrow working space. The authors introduced a lasso-loop stitch to arthroscopic repair of the ATFL alone. The patient is placed in a supine position on an operating table under spinal or general anaesthesia. It is important keep the ankle elevated above the opposite leg by approximately 20 cm using a leg holder with the foot at the distal edge of the bed in order to allow full dorsiflexion of the ankle. No distraction of the ankle joint was necessary. 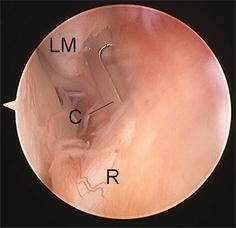 A 2.7 mm, 30° arthroscope was used with an irrigation pump at 60 mmHg. Two initial anterior arthroscopy portals were used—the arthroscope was introduced through a medial midline (MML) portal just lateral to the tibialis anterior tendon, and this portal was used to identify the correct position for the accessory anterolateral (AAL) working portal by trans-illumination of the skin (Fig. 1). A needle was used to ensure the correct position of the portal enabling dissection to the fibular ATFL attachment prior to skin incision and blunt dissection with a mosquito clip. Hypertrophic scar tissue was removed where necessary from the lateral gutter using a motorized shaver via the AAL portal, while all other soft tissue including joint capsule and fibula periosteum was left intact. 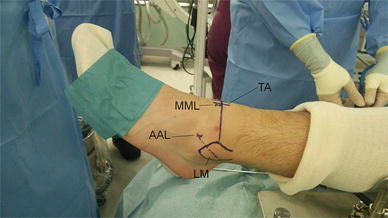 A suture anchor is placed in the fibula ATFL footprint via the ALL portal. The correct position is ensured by identifying the fibula attachment of the anterior inferior tibiofibular ligament (AITFL) and the drill hole made approximately 7 mm distal to the lower edge of the AITFL. The anchor is then inserted into this hole and leaving the anchor sutures exiting through the ALL portal (Fig. 2). For the lasso-loop stitch, an 18G hollow needle with a 2-0 nylon thread is placed through the ALL portal and into distal ATFL remnant. The needle is rotated several times one way and then in the opposite direction, enlarging the nylon loop (Fig. 3). The loop of the nylon is retrieved through the ALL portal with a grasping instrument, and the needle is then withdrawn. One end of the anchor suture is then passed through the loop of nylon. The nylon loop is then used to pull just the mid-portion of the anchor suture through the ATFL such that a loop of suture is created in the ATFL. The free end of the suture is then passed through this loop and pulled tight creating a self-cinching stitch (Fig. 4). The other end of the anchor suture is then used to draw the self-cinching stitch tightening the ATFL (Fig. 5). Then, square knot and granny knot are done two times using a knot pusher by turns to an axial thread (Fig. 6).